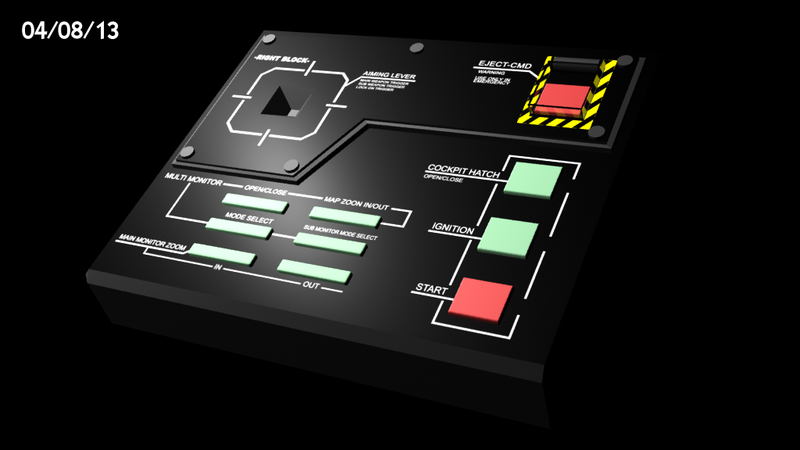 Anyone who had a copy of the DVD for Fallen Star episode 1 will have seen the cool ‘interactive bridge’ menus that I made for it. For the upcoming second episode DVD, I wanted to expand upon this idea and see the entire bridge in full, but this would mean I would have to fully kit-out the virtual environment with the remaining bits and pieces. So I wanted to share one particular piece here. 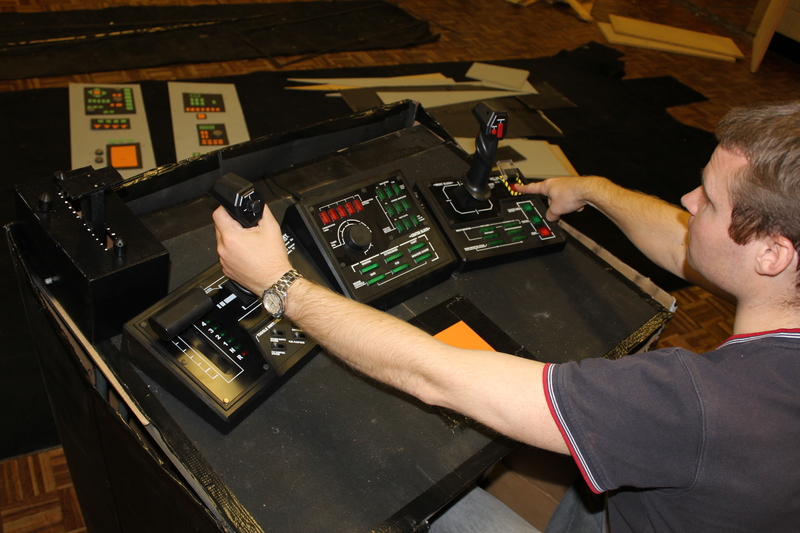 By far, the most difficult part of our set to replicate as a digital model was the helm control station. 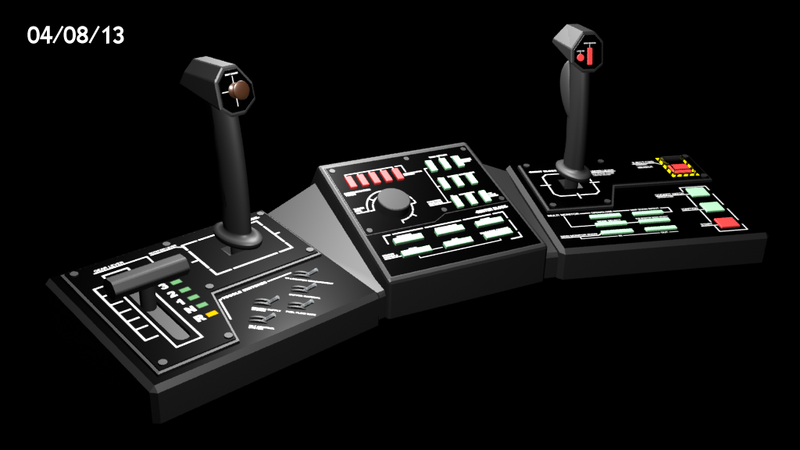 We used a controller for an Xbox game called Steel Battalion, so I had foolishly assumed that somebody, somewhere in the world wide web, had created a 3D model that I could copy for my own purposes. No such luck. Once it became clear that I would have to model this myself, I started to break it down into pieces. Despite how complicated it looks, it’s really not too difficult once you take it piece by piece. Most of the detail is simply stuck on as a texture – the shape of the components is fairly simple. The proportions are by no means accurate. I didn’t measure anything, I simply looked at a lot of photographs and reference material and did some guess work. If it looked right, it was right. 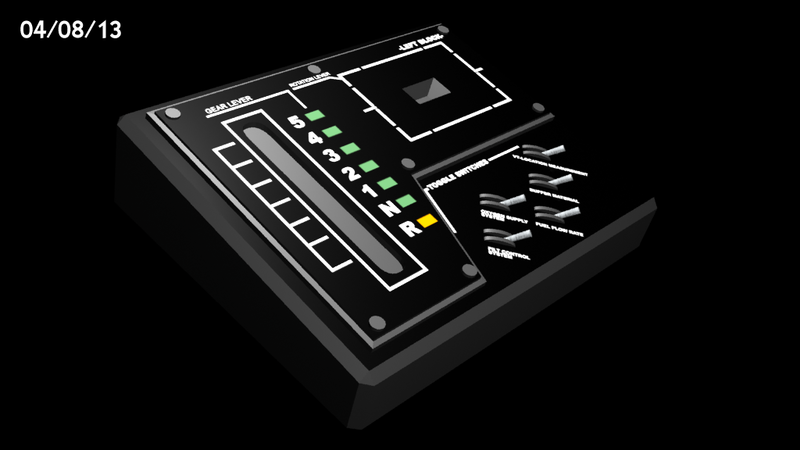 Thankfully, there is plenty of reference material on the web for this controller, and I was able to replicate all of the button labels very close to how they are on the real thing. Once the bases were made, it was time to stick the various levers and handles to it. 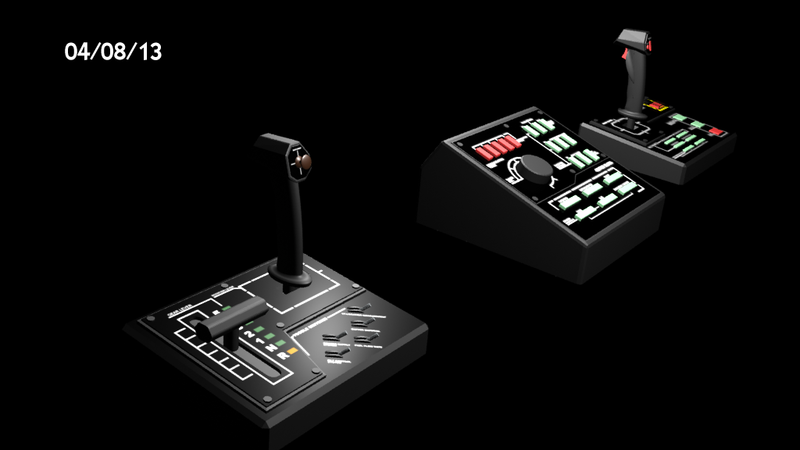 By far the hardest part of this was modelling the joysticks. These are a more organic shape, which meant I had to apply bending and warping effects, and stick multiple shapes together. Again, it’s not completely accurate, but I was pleased with how close it was to the real thing for my purposes. Once joined together, the final model looks pretty amazing, if I do say so myself! I’m very pleased with how authentic it looks. 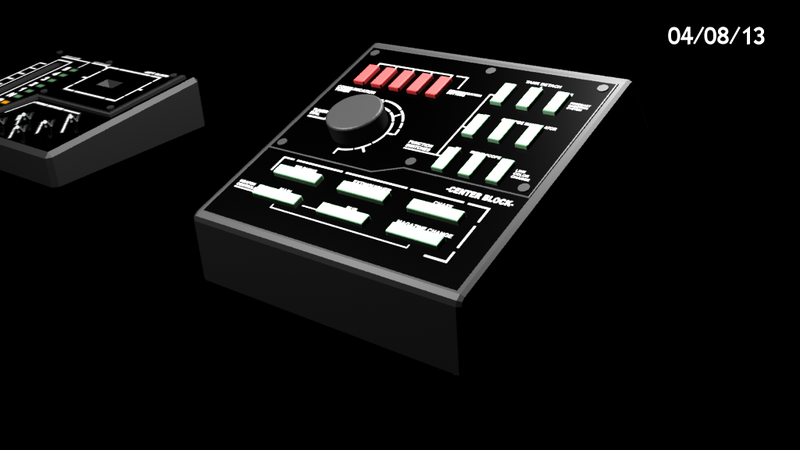 Here is the actual physical controller, for comparison. 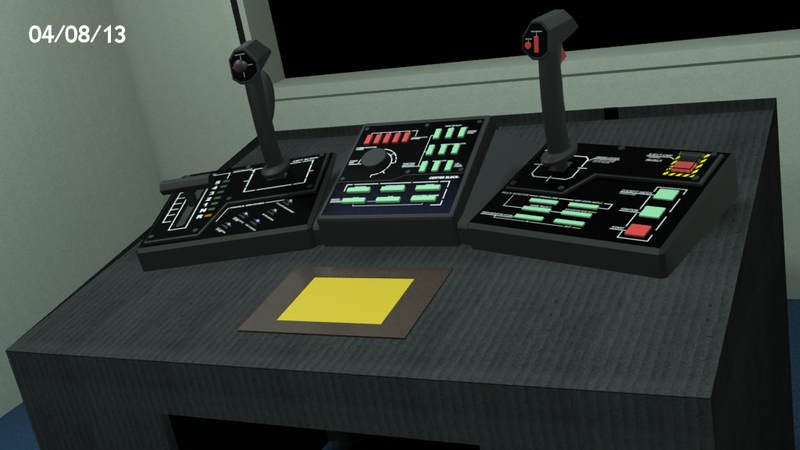 Now that I have this, the helm station is finished and the virtual bridge is complete! Who would have thought our cheap and simple film set would have its advantages?